Temperature is a critical environmental variable determining the metabolic rates of organisms, their distribution along a river's length and over geographic regions, and quite possibly their success in interacting with other species. Because species composition and biological rates are temperature dependent, ecosystem processes including leaf breakdown, nutrient uptake, and biological production are affected as well. Stream temperature changes in response to a variety of human actions, and so management intervention may be required to maintain a natural range of stream temperatures. The temperature of running waters usually varies on seasonal and daily time scales and among locations due to climate, extent of stream-side vegetation, and the relative importance of groundwater inputs. Stream temperatures can be quite constant wherever groundwater inputs are important, as in springs and some headwater streams. Even medium-sized rivers that are fed by large groundwater aquifers, such as the Metolius in Oregon and the Manistee in Michigan, will show significantly less seasonal warming and cooling than rivers in the same climate that are fed by shallow subsurface flowpaths. Very constant river temperatures are also found in tropical locations owing to the constancy of solar radiation throughout the year and, in the case of large rivers, their thermal inertia. The Amazon River at Manaus, Brazil, at 29 ± 1°C, is one of most thermally stable water masses in the world (Sioli 1984). In most temperate rivers, the annual temperature range is between 0°C and 25°C, but desert streams can reach nearly 40°C, which is near the thermal tolerance even of fishes adapted to these extreme environments (Matthews and Zimmerman 1990). At high latitudes and elevations, maximum temperatures rarely exceed 15 °C, and they can be cooler yet in very cold climates where ice-cover can extend for over half the year. 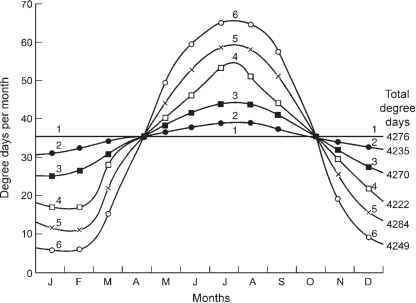 Seasonal changes in water temperature in rivers closely follow seasonal trends in mean monthly air temperature, except that in winter the water temperature does not fall below 0°C, and rivers warm more slowly in spring than does the atmosphere. For temperatures above freezing, Crisp and Howson (1982) found that mean weekly water temperatures (and the growth rate of brown trout) could be predicted from air temperatures using a 5- to 7-day lag. Some 60% of their estimates were within ±1°C, and 80% within ±1.5°C, of the measured stream temperatures. Despite the frequent use of correlations between air and water temperatures, however, solar radiation, not convective warming of water by the air, is the main heat input to streams, and so air temperature is better viewed as a surrogate rather than a causal variable (Johnson 2003). Because temperature varies through the seasons as well as with location, the number of degree-days, calculated by summing daily mean temperatures above 0°C, provides a useful measure of the cumulative temperature that an organism experiences. This approach shows that even when sites experience similar maximum summer temperatures, degree-days can be very different. For example, three sites in a Rocky Mountain stream all experienced similar maximum summer temperatures near 16°C, but the annual degree-days were estimated to be 800 at 3,350 m, 1,000 at 3,050 m, and 1,500 at 2,740 m (Allan 1985). As Figure 5.10 illustrates, the same number of degree-days can result from very different seasonal temperature patterns (Vannote and Sweeney 1980). Six locations along a stream in Pennsylvania each accumulated about 4,200 degree-days annually, but temperature variation throughout the year was much more pronounced at downstream sites. Organisms living in the headwaters would experience cool, constant temperatures year-round, and presumably be physiologically adapted to such conditions, whereas the relatively short but very warm summer season at downstream locations would favor those organisms best adapted to grow quickly at higher temperatures. As can be seen in Figure 5.11, annual degree-days decrease with increasing latitude. Values in the range of 3,000-5,000 degree-days are typical of temperate, low elevation sites. At subtropical Silver Springs, Florida, annual degree-days were in excess of 8,000 (Odum 1956), which is an order of magnitude greater than at the highest elevation Rocky Mountain stream studied by Allan. 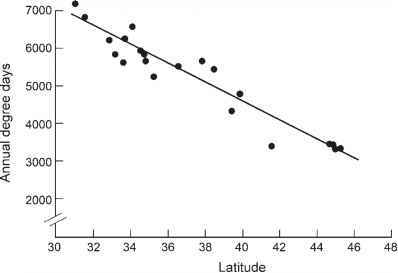 and latitude is influenced primarily by solar radiation. Considerable thermal heterogeneity also occurs at meso- and microhabitat scales in response to local air temperature and wind speed, which influence evaporative cooling; temperature of the source water, which is strongly dependent on the relative amounts of ground-water versus surface runoff; and the extent of topographic and riparian shade (Poole and Berman 2001). Lakes, impoundments, beaver ponds, and even the frequency of pools along the channel tend to increase stream temperatures because they increase the residence time of water and the surface area exposed to solar radiation, and thus allow for more warming (McRae and Edwards 1994, Hawkins et al. 1997). In geologically complex regions, the source water of the tributaries of a single river system can be very different, resulting in a wide range of thermal habitats among headwaters that in turn may favor greater biodiversity as well as provide unique thermal niches for endemic taxa (Milner et al. 2001). In alpine streams of the French Pyrenees where source waters include glaciers, snowpack, karst groundwater, and hillslope aquifers, karstic groundwater streams are coolest and most stable, hillslope groundwater streams are warmest and most variable, and glacial streams warm and become more variable downstream (Brown et al. 2005). Temperature variation due to source water and flow paths can be observed at much finer scales as well. In floodplain sections of the Tagliamento, a large, braided river of the Swiss Alps, cool-water habitats governed by groundwater inputs differ by as much as 15 °C from warm-water habitats of semi-isolated backwaters (Arscott et al. 2001). Microhabitat-scale temperature variation is also observed when streamwater is forced into or drawn out from the streambed due to topographic undulations, meanders, bars, or other channel obstructions (White et al. 1987). The temperature of large rivers is unlikely to be affected much by shading, as their size conveys considerable thermal inertia and virtually ensures that they are highly exposed to the sun. In small streams, however, riparian forest moderates stream temperature by reducing the amount of solar radiation reaching the water surface, which also reduces the extent of temperature change between day and night (Beschta et al. 1986). 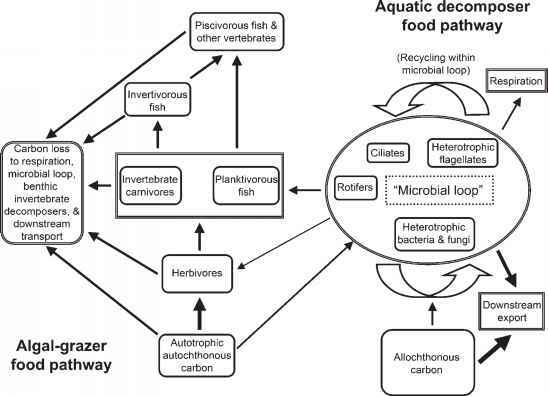 An extensive literature documents the influence of the presence or absence of shade on water temperature, particularly in the context of logging practices and the impact of stream warming on salmonid fishes. Forest harvest usually results in substantial warming of stream temperatures, by as much as 13°C, and daily ranges have increased by as much as 7-8°C (Moore et al. 2005). Riparian buffers can substantially ameliorate these effects, supporting the management recommendation that a riparian width equal to one tree height be retained. As vegetation and shade recover in logged riparian zones, temperatures return to their prior state, often within 5-10 years. Small streams that flow through alternating pasture and woodland provide further evidence of shade effects, showing temperature differences of several degrees (Sweeney 1993). The influence of riparian shade diminishes with increasing stream channel width due to the natural gap in forest canopy in wider streams, and so riparian thinning may be of minor importance at stream widths >10 m (Davies-Colley and Quinn 1998). This influence of stream size on direct warming due to solar radiation is evident in the relationship between maximum daily temperature range and stream order (Figure 5.12). Small headwater streams are thermally stable due to groundwater influence and the additional effects of riparian and topographic shading, whereas large rivers are thermally stable due to their large water mass. Streams of intermediate size are large enough to be minimally influenced by riparian shade and of small enough volume to warm and cool between day and night. Human actions influence stream temperatures in a number of ways. By reducing river volume, water withdrawals reduce the temperature buffering capacity of the river; furthermore, reduced flows may result in longer residence times and thus greater heat absorption. In urban areas with substantial areas of impervious surface, water passing over roads and other built structure can be heated well above the natural range (Paul and Meyer 2001). Models developed specifically for streams subject to urbanization indicate that shade, groundwater inputs, and stream width have the greatest influence over stream temperature, thus suggesting management options likely to be most effective in ameliorating human impacts (LeBlanc et al. 1997).